Seatech are a thriving international company who were looking at creating a base in the City of Southampton. With its bustling port, Southampton provides the right locale for a business that specialises in refurbishing cruise liners – this is what Seatech UK ltd do and they do it very well. Mirko and Michal, the guys behind the Southampton operation, are constantly flitting around the globe managing large scale projects in very small timescales. They needed a base to extend the admin for the business to control the increasing strains on that rare commodity called ‘Time’. HMF offered a solution by creating a first floor office space in their existing unit. 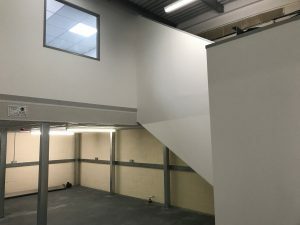 The unit was around 6 metres tall, so could accommodate a mezzanine floor comfortably and this was linked to the ground floor by a general access staircase. 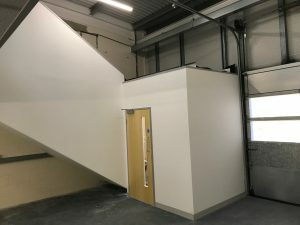 The staircase was fire protected to contravene with building and fire regulations and this led in to a 35m² carpeted office space. There are two glazed windows which overlook the unit downstairs and opaque ceiling tiles which let in a little extra day light from the unit ceiling above. Seatech UK are now ready to move into the new space and let’s hope time is on their side!